I'm excited to tell you all about a new sweater that I've cast on. Remember my pink sweater? I enjoyed knitting up that pattern so it was only natural to pick up some Madeline Tosh Merino Light and start another one. I adore the top down construction and the intricate detail to the shoulder shaping. What is not to love when there's ruching involved? Exactly! My colorway is "wicked" which makes me sing "defying gravity" (great musical by the way). My love of madeline tosh yarn is overriding my slight concern that this yarn is a single ply. So there is a bit of a worry that it will pill with wear. For now I've thrown caution to the wind and I'm knitting on. My fingers are crossed. Maybe I'll walk without swinging my arms? While I was in a bookstore, I scoured the area looking for "Call the Midwife" memoir. We only started watching this season and I knew I had to have a copy. I could not locate the memoir, so I asked for some assistance. Poor poor guy. He did bring me a copy but it was one with the actresses from the show plastered on the cover. I wanted the original cover. So off he went-again. And yay for me I have a THE book! I only cracked open the beginning so no opinions yet. My 100 Year Old Man etc.. has become a "read during the day book". There is history thrown in and when I'm tired it puts me to sleep. (that is how I felt about history while in high school) So I read during the day and find it much more enjoyable. If you like action, adventure and a history lesson this book is for you. There is NOT deep character development and I think that is where my book tastes lie. It is well written and translated. That yarn looks delicious! And so soft! I want to get my hands on the Call the Midwife memoir as well! I have only watched a couple of episodes of the show, but so far I like it! Ooh your new blog banner is so pretty! 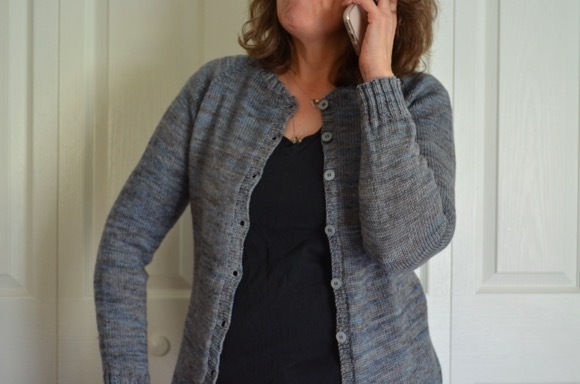 I'm glad I'm not the only one repeating cardigan patterns again and again. I love the tv series, I might put the book on my wishlist. That is going to make another super sweater! I love the color of your yarn! It looks like it will be soooo comfy. Thanks for the reminder about Call the Midwife - I've been meaning to put a hold on it at the library. It's such a fascinating show, I'm sure her memoir is wonderful. Love the sweater! MadTosh is a great yarn. Her store is here in Fort Worth and I love popping it, Call the Midwfe is a must on Sunday nights in our house. I too am reading the first book. Pretty purple. :) Funny how book covers matter, isn't it? Enjoy the reading! Oh my, i love that sweater! I love! I haven't been able to see Call the Midwife yet! I didn't know it was based on a book. Also, I love your wicked Tosh! I bet it won't pill, I have lots of friends who wear it and I haven't heard anything bad. oh my goodness that sweater is going to be amazing in that colorway! excited to see how it turns out. History was my only interest in school. Well, that and creative writing. I'm still a history fanatic, though. Love the "Wicked" colorway. I've never used Madelaine Tosh but have heard wonderful things. How do you walk without swinging your arms? That color is so beautiful. It will make such a perfect sweater. I love watching Call the Midwife, maybe I'll need to read this book soon. Oh I have been wanting to see this series - I am going to see if netflix carries it - thanks for sharing. Lovely color for your new sweater. I've got season one of Call the Midwife on my instant queue on Netflix. Can't wait to finally get around to watching it. And Tosh Merino Light ... aaaaah, my favorite yarn. :) I knit a sweater from it and it does pill a bit, but it is so soft and warm and comfortable to wear. I am contemplating knitting my next sweater from it as well. hee hee andee! your sweater is going to be beautiful karen, that color is gorgeous. i have yet to open my book either, but i am so looking forward to the midwife series! Love the colors in your yarn. What a pretty sweater that will be. I enjoy Call the Midwife. I may need to try the book too. I love the color for your new sweater - now that I have three little girls, deep purples have become some of my favorite colors! I think I need to pick up a copy of Call the Midwife; we only just started the show too and I knew by the end of the first episode that it was going to become one of my favorite shows! I love the dignity with which they treat every character and imagine that stems from a real perspective in the book; even people who don't hold "current" values are treated with respect and understanding, which is unusual in a television show! Oooooo, wicked! ; ) Love it! Can't wait to see your progress. I missed that show on PBS. I'll have to try to get a hold of it on Blu-ray. Oh that is going to make an awesome sweater, love it! Lovely yarn, gorgeous colour. Pretty sweater. Your so funny ~ walking without swinging your arms. :) I be it will be beautiful, all your work is! And I'm kind of partial to that color! I get a little sleepy with too much history, as well. My "Persian Pickle Club" isn't full of history but it's kind of a doze-y read, too (thus the weeks it's taking me to finish!) Enjoy your newest read! I so loved your pink cardi, Karen!!! And this one is going to be just as awesome!!! I need to get off the shawl kick and do something more wearable!!! Love it. LOVE the color - lavender is my favorite! And I glad you persisted and found the original book...makes it special...reading, knitting, cross stitching along with everything else in life...busy, busy! Good job getting the "real cover"! Looks like a real nice sweater in the making. haven't heard of the series, but I can tell you I would probably dig it. I'm a die-hard "natural birthing" mama. I read so many midwife books when I was pregnant with my kids....gosh. SO many. Beautiful yarn!!! I am a nurse in a past life who worked OB....I love the Midwife series, but with three teen boys and two youngers....it is a tough one to watch with kids running around :) So...I would actually love to read the book, I didn’t realize there was a book!! Glad I found your blog!! Is the Call the Midwife book the same as the tv show the BBC did? I saw some of the show, but have not read the book. I went to the store and picked up a copy of the book yesterday - they only had one copy with the original cover! I haven't watched the show, although I want to, because many people told me not to watch it while pregnant (these were pregnant people who had watched it and found it difficult). As for what I am knitting - Vitamin D cardigan. With a newborn I only get a few rows done here and there. I love that yarn! It looks so gorgeous, and I will be excited to see the finished sweater! 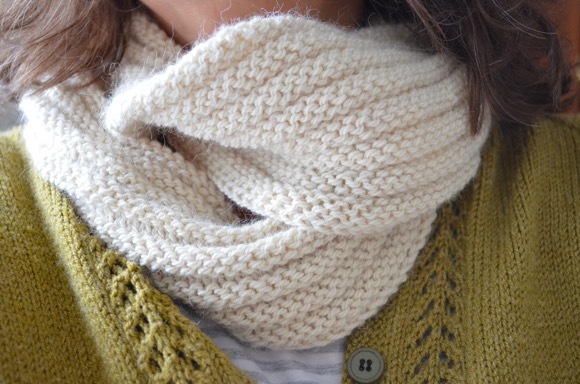 I have never made one, since my skills may not be that advanced yet, but I was thinking of trying to find an easy one Ravelry...you've inspired me!